When there is so much excellent original music being performed live around the town should the Hastings Independent be reviewing tribute bands? It’s a moot point and for much of the past couple of decades I’ve been pretty dismissive of the whole tribute band scene; but two things began to change. Firstly, being exposed to world-class tribute acts, like Australian Pink Floyd, appearing on festival line-ups alongside original artists and experiencing first hand the sheer quality of the musicianship, regardless of whether it was original or not. Secondly, reflecting on the legacy of some truly iconic acts in the wake of a seemingly endless succession of rock star deaths in recent months, not least one Lemmy Kilmister at the end of 2015, and concluding that it would be a particularly severe case of cutting off one’s nose to spite one’s face to refuse to celebrate and enjoy the music of, say, David Bowie or The Eagles or Motörhead in a live setting just because the instigators are no longer with us. No-one ever got sniffy about the artistic validity of the Royal Philharmonic performing an evening of Beethoven so should celebrating the music of some of rock’s greatest icons really be that much different? So here we are at The Carlisle then to witness the Motörhead tribute act, Motorpace. First, however, the band as they put it themselves “are their own support act” and rattle through a number of heavy metal staples by the likes of AC/DC, Metallica and Judas Priest before doing a full second set in full-on tribute band mode. Wisely, apart from the bass player/vocalist sporting some Lemmy-esque facial hair and a vaguely rock n roll-ish leather hat, the band avoid the temptation to play-act the roles of the former members of Motörhead and instead concentrate on getting the sound right; which they do with devastating precision. All the essential ingredients are there: the fast and furious bass-playing rumbling away like some industrial power tool, the hoary, growled vocals, the blinding guitar solos, the power drumming. It goes down really well with the Carlisle crowd which has swelled significantly by the time the band come on stage to do their main set in tribute to Lemmy and co. Punters lap up the likes of We Are The Road Crew, The Chase is Better Than the Catch, Overkill and, of course, Ace of Spades as well as more recent material like Thunder & Lightning from Motörhead’s final studio album, Bad Magic. I’ve certainly become far more philosophical about tribute acts. If your entire experience of live music was to be nothing but an endless stream of tribute acts, each aping the glory days of bands gone by, that would be rather sad indeed; but as part of a balanced musical diet I see absolutely nothing wrong with taking in the odd tribute concert. This is especially so when the quality of the performance is as good as that delivered by Motorpace this evening. 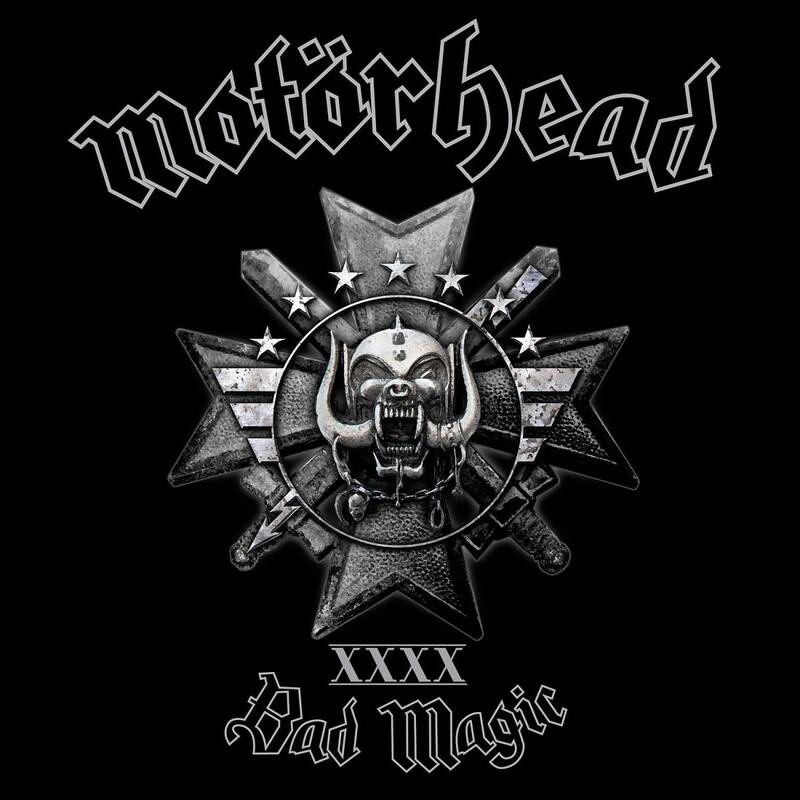 Bad Magic, Motörhead’s 22nd studio album in the band’s 40th year, opens in classic Motörhead fashion with Victory Or Die. All the essential ingredients are there: the fast and furious rumbling bass, the hoary, growled vocals, the blinding guitar solo, coupled with a memorable rock ‘n’ roll tune and some world-weary seen it all, done it all rock ‘n’ roll lyrics. It’s a strong opener. For sure, Lemmy’s voice might sound a bit more aged than previously. But given his well-publicised health problems in recent years it’s something of a miracle that this album sounds as good as it does. Many of the songs wouldn’t sound at all out of place on some of the albums from late 70s/early 80s “heyday” period. Thunder & Lightning and Electricity are both stand-out tracks for me in that vein, as well as the aforementioned Victory Or Die. It’s not all completely predicatable, though. Two tracks depart significantly from the tried and tested Motorhead formula. Firstly, we have Till The End, a slow number that has Lemmy spelling out his life philosophy with some suitably heavy but melodic backing. And we also have a cover of the Stones’ Sympathy For The Devil. “Motörhead sing the Stones” could have sounded a bit gimmicky but, surprisingly, it comes off. A wall of thunderous drum sound provides an atmospheric backdrop for Lemmy to let rip on the old Jagger/Richard classic. Did I need another studio album by Motörhead? If truth be told this is the first new studio album of theirs I’ve bought in years. But admiration for how long they’ve kept going twinned with a realisation that this is a band almost certainly in the final stages of its long career drove me to buy it. I’ve not been disappointed. An added bonus of buying tickets for Black Sabbath in Hyde Park was having the chance to see Motörhead on the bill earlier in the day. Lemmy’s recent health problems had left some question marks over the future of the band and so, five years after I’d last seen them, it was good to catch up with them again on stage. However, while Motörhead’s “best of” CD and their iconic No Sleep ’til Hammersmith live album are frequently blasting from my stereo, I must confess to having heard not a single album Motörhead have recorded since about 1982. And although we were treated versions of Stay Clean, Ace of Spades and Overkill that owners of the No Sleep… album will be very familiar with, there were several songs in the 45-minute set with which I was unfamiliar. 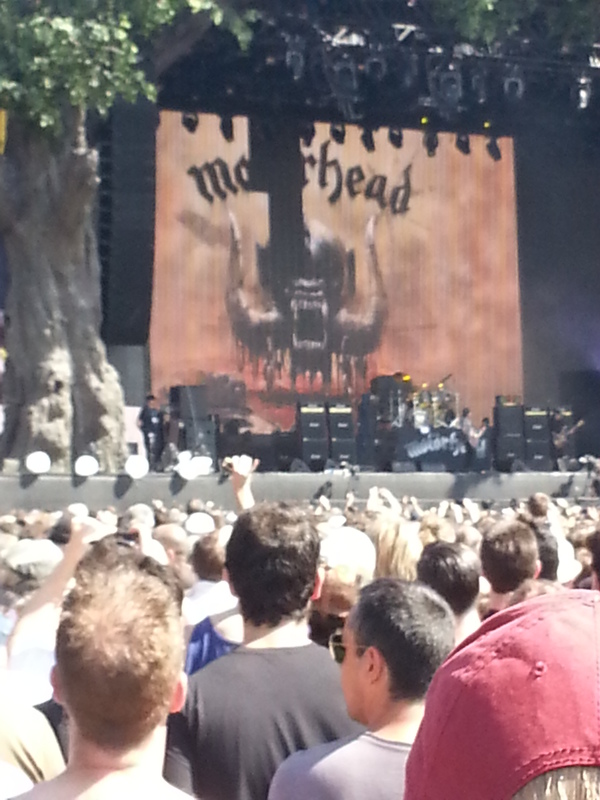 The thing about Motörhead, however, is consistency: in sound, in quality and in attitude. So while a particular song they are performing may not be a classic from the Overkill/ Bomber/Ace of Spades era, it manages to sound exactly like it should be. As well as iconic front-man/bassist extraordinaire, Lemmy Kilmister, Motörhead are Phil Campbell on guitar and Mikkey Dee on drums and while neither were in the band in the early “classic” years, Campbell has been with them for thirty years and Dee for over twenty. As for Lemmy, you wouldn’t think it from his vocal delivery and certainly not from his bass-playing, but it’s during his brief between-song banter with the audience that you realise that Lemmy is now quite an old man. Will Lemmy and Motörhead be around forever? Obviously not. Will they be performing for that much longer? If truth be told, probably not. Is it still worth seeing them? On today’s performance – most certainly yes. Catch them now while they are still a living, working unit, still delivering the classic Motörhead sound.